If you are anything like me, then you like to snack! Being the very pregnant lady that I am, I can usually be found munching on something at any given time of the day. Finally, my morning sickness has seemed to subsided for now and I am able to munch again without feeling nauseous. HOORAY!! One snack that I find to be really filling and satisfying is popcorn. My flavor of choice is usually butter because that is all I have at home. The hot and steamy bowls of popcorn just taste so good and really hit the spot for me. My children are getting to an age where they too like popcorn and they are no longer at high risk of choking on it. So, it makes a great snack for them as well! It all started when Colby was 14 years old. One of his good friends invited him to be a chef for his startup Kettle Corn Company. Colby agreed and began learning the tricks of the trade. During that time Colby began to imagine some new and innovative ways to improve the process. They eventually went their separate ways when the company started experiencing financial problems. Later, when Colby was about 16 years old, he took some kettle corn to a family reunion. There, he explained some of his ideas to his uncle. With some further communications and a little luck, they built the kettle that Colby had dreamed of. That same year he acquired a contract with a large retailer to be a traveling vendor. This allowed him to take his kettle to any associated retail stores and try it out. He soon found out that his improved process was an instant success. People started following him from one store to another. With this success, Colby wanted to find a way to provide his now famous kettle Corn to everyone. And the rest, as they say, is history. Colby's Kettle Corn is now distributed throughout the Western and Mid- Western United States. Along with distribution to four other countries! Even though Colby's Kettle Corn is much larger now, they will always use his secret process to insure that when you pick Colby's, you pick quality. 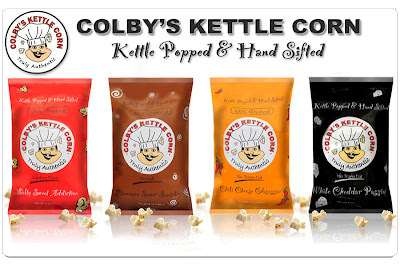 Colby's Kettle Corn comes in a variety of flavors, all of which sound sooo great! You can choose from Salty Sweet, Cinnamon Sugar, Chili Cheese and White Cheddar. There is a flavor in there for everyone! Sweet Salty Addiction, White Cheddar Passion and Cinnamon Sugar Sensation. These came on a day when hubby was out of town and my son was sick. It was a fabulous pick-me-up and made for a nice treat for us. I poured some from each bag and my daughter and I dug in! ]The flavor of this popcorn is not overwhelming...it is just right. Each flavor is distinct and you can definitely taste the kettle-cooked flavor. Our favorite flavor had to be the Salty Sweet Addiction as it really satisfies my sweet tooth cravings. It has just enough salt to be noticed but not so salty that I have to drink a ton of water afterwards. As soon as my son was feeling better he wanted to try some of this popcorn too and he could not keep his hands out of my bowl!!! Colby's Kettle Corn is a wonderful product because it is perfect for vegans, dairy intolerant people and those who are on a gluten-free diet. I was talking to a friend of mine and she is gluten-free. She told me how hard it is to find gluten-free snacks and that this popcorn sounded so wonderful! I gave her a bag and told her to enjoy...she was VERY excited about it! Colby's Kettle Corn can be found in various states across the US and you can find a store near you using their store locator. You can also purchase it online directly from the company online. Prices vary depending on the quantity that you want, but generally the retail value of a bag is around $4.00. If you would like to keep up with Colby's Kettle Corn, make sure you follow them on Facebook! They are always having promotions and discounts there that you are sure to love! You can also check out their website for new products and announcements. They have also graciously extended a special 60% discount code to my readers for your first purchase from Colby's Kettle Corn! That code is OPINION. This code expires on 4/8/12 at midnight. My little guy enjoying his Colby's Kettle Corn! :) He loves it! Disclaimer: I received no monetary compensation for this post. I did receive free Colby's Kettle Corn products for review purposes. All quotes and stock photos are from the Colby's Kettle Corn website and email. Prize is being shipped by the sponsor. All thoughts and opinions are 100% mine. I would like the chili cheese obsession. My first pick would be Cinnamon Sugar! I would like to try the White Cheddar flavor! White Cheddar Passion is the flavor I am most eager to try. :-) Thank you. I'd like to try the cinnamon sugar sensation. I'd love to try their Cinnamon Sugar flavor. I would like to try the cinnamon sugar flavor. I'd love to try the Chili Cheese! I would love to try Cinnamon Sugar Sensation. Cinnamon Sugar Sensation would be my choice, but most of those sound pretty good. The Chili Cheese Obsession sounds delicious! Thanks so much for hosting this great giveaway! I would like to try the Cinnamon Sugar. Please replace with this entry. I'd like to try Chili Cheese Obsession. The white cheddar sounds great. The chili cheese sounds tasty! White Cheddar Passion looks great. I would love to try the white cheddar passion! I would love to try the White Cheddar Passion flavor. Thanks. Id like to try White Cheddar Passion! I want to try the Chili Cheese Obsession. I would love to try cinnamon sugar! The Salty Sweet Addiction sounds really good! I'd like to try Chili Cheese Obsession! I'd like to try salty sweet addiction! I would like the cinnamon sugar. Cinnamon Sugar! Or, any of them! I would like to try the Chili Cheese Obsession. Would love to try the White Cheddar Passion flavor! The white cheddar sounds good to me! I would like to try the Chili Cheese. I would like to try the White Cheddar Passion.